Yes, we like cheese and attempt to emulate it quite often. 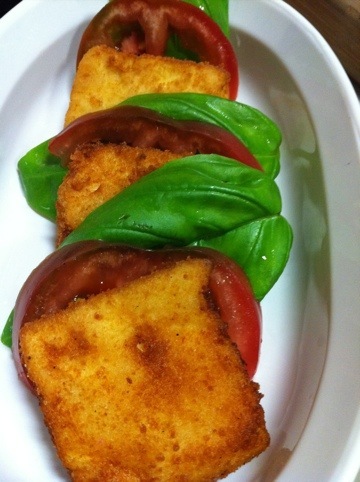 We especially like cheesy Italian fare and Caprese has always been a must for us as an appetizer. This is a pretty satisfying dairy free version. Buon Appetito! I use a deep fryer at 375 to make my tofu. If you don’t have a fryer you may fry in a regular pan with olive oil. In order to marinade the tofu you can either let it sit in marinade for a minimum of 3 hours or if you are in a hurry put it in an oven safe dish and bake at 350 degrees for 20 minutes. I have used both methods with the same results. In a two cup measuring cup mix the above marinade ingredients until it’s a smooth liquid. Add water so entire mixture equals two cups. Mix together. Drain package of tofu. Cut tofu so that you have 2″ X 2″, 1/4″ thick squares ( I cut length wise and then in 1/4″ cuts. Lay tofu down in container of choice and cover with marinade. If you need to layer tofu in container cover each layer before adding next layer of tofu. Gallery | This entry was posted in Anzia's picks-a young vegans perspective, appetizer, Italian and tagged basil, breaded, caprese, Italian, non-dairy, vegan. Bookmark the permalink.